2017 Suzuki Access 125. Picture credits - Suzuki. Submit more pictures. The New Suzuki Access 125 is our flagship scooter which combines the best of both worlds - power and mileage - with our revolutionary SEP technology. A complete redesign from the ground up - both aesthetic and technical - emphasizes that this scooter welcomes any road. The New Access 125 boasts a state of the art SEP engine, new frame, optional disc brake and various updates to wheels, suspension, transmission and body panels; giving it improved fuel efficiency, performance, cornering stability, smoother ride and added protection. Ask questions Join the 17 Suzuki Access 125 discussion group or the general Suzuki discussion group. Bikez.biz has an efficient motorcycle classifieds. Ads are free. 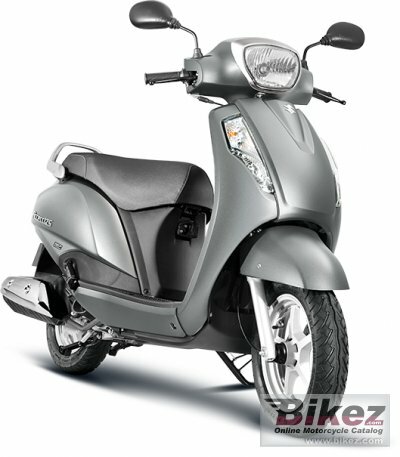 Click here to sell a used 2017 Suzuki Access 125 or advertise any other MC for sale. You can list all 2017 Suzuki Access 125 available and also sign up for e-mail notification when such bikes are advertised in the future. Bikez has a high number of users looking for used bikes. Before you buy this bike, you should view the list of related motorbikes Compare technical specs. Look at photos. And check out the rating of the bike's engine performance, repair costs, etc.